This component convolves the image with maximum filter. Each voxel is set to the maximum value of its neighborhood. The neighborhood is defined by a kernel, which has a diameter of 3 voxels. This component convolves the image with minimum filter. Each voxel is set to the minimum value of its neighborhood. The neighborhood is defined by a kernel, which has a diameter of 3 voxels. The freely available software module below is a 3D LoG filter. It applies a LoG (Laplacian of Gaussian or Mexican Hat) filter to a 2D image or to 3D volume. Here, we have a fast implementation. It is a perfect tool to enhance spots, like spherical particles, in noisy images. This module is easy to tune, only by selecting the standard deviations in X, Y and Z directions. This protocol perform a median filter on the active sequence using the ImageJ rank filter plugin. Then, it converts the result back into Icy for display. 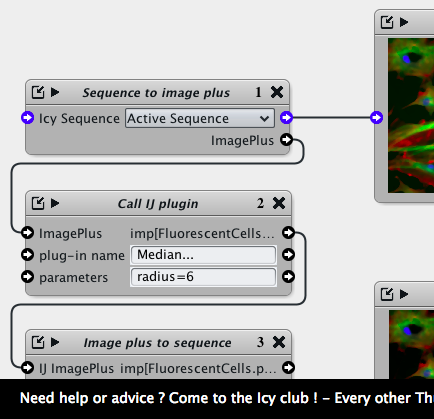 An example showing passing data between ICY and ImageJ using ImagePlus object. 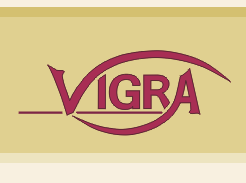 VIGRA is a free C++ and Python library that provides fundamental image processing and analysis algorithms. Its generic architecture allows it to be used in many different application contexts and ecosystems. It is designed as an intelligent library (using the C++ template mechanism) which allows users to write code at a fairly high level of abstraction and optimizes away the abstraction overhead upon compilation. It can therefore work efficiently on very large data and forms the basis of ilastik and CellCognition. continuous reconstruction of discrete images using splines: Just create a SplineImageView of the desired order and access interpolated values and derivative at any real-valued coordinate. Image Processing: STL-style image processing algorithms with functors (e.g. arithmetic and algebraic operations, gamma correction, contrast adaptation, thresholding), arbitrary regions of interest using mask images image resizing using resampling, linear interpolation, spline interpolation etc.